Current Fax Broadcast. Scroll down for archive of previous fax broadcasts in 2009. This page is best viewed on Internet Explorer. All other web browsers require scrolling in and out of right margin. LORD CHILCOT, DO YOU REALLY WANT TO HURT ME? DO YOU REALLY WANT TO MAKE ME CRY? NEW YORK, NEW YORK * 14 December 2009 Citizen of the USA Stephen M. St. John addresses the international community in New York and advises Lord Chilcot that the Iraq Inquiry is, to borrow an old Anglo Saxon word, nidering. Just when we need a prince of the realm to do justice and judgment, we have instead a game of shifting blame from the UK to the USA when all along it was the Zionists egging both on to war. Bush and Blair and their Zionist Neocon advisers should be hanged after proper security style interviews and trials for war crimes and violations of international law including the Nuremberg Principles. The Hutton Inquiry avoided queries that were repeated to the Iraq Inquiry last week on the email form and are repeated here again. Was Dr. David Kelly at United Nations headquarters in New York City at any time between 23 and 28 March 2003, the week after the commencement of the shock and awe aggression on Iraq? If yes, what was the purpose of his visit? And why wouldn't the Hutton Inquiry answer yes or no? For background, see http://www.show-the-house.com/id27.html. When Dr. Kelly died, the cat was already out of the bag about the big lies that were told in order to wage illegal aggressive war. You did not have to be a rocket scientist to figure this out. But as big as these lies about WMDs in Iraq were, they are little when compared with the BIG LIE about "Rabbi" Dov Zakheim's "new Pearl Harbor"; i.e., the shock and awe attacks of 9/11. Proof that the Arabs were framed for this crime of the century in a false flag military intelligence operation cloaked in national security secrecy appears at http://www.show-the-house.com/id92.html. How much longer can this be ignored? The vast majority of people will reject this cruel and crazy and immoral behavior, but only if they know about it. "Clear-eyed, we can understand that there will be war, and still strive for peace. We can do that -- for that is the story of human progress; that's the hope of all the world; and at this moment of challenge, that must be our work here on Earth." New York, New York * 2 December 2009 Citizen of the USA Stephen M. St. John addresses the international community here in New York City and cautions against the policy of further pursuit of military objectives in Afghanistan which President Barack Obama announced in his speech last night at West Point. While undoubtedly sincere, President Obama is ill served by his advisers, particularly his warmongering Zionist advisers, who are the lowest common denominator of both the Republican and Democratic parties. President Obama spoke about numbers of troops but never once mentioned deployment of private mercenaries and contractors whose activities are beyond accountability. His head of the CIA, Leon Panetta, once said there were only 5,000 of them in Iraq in the Iraq Study Group Report. The truth is there were more than 150,000. Is the Pentagon's "yes" man doing it again in Afghanistan? President Obama made several references to the attacks of 9/11, on which the logic of the invasion of Afghanistan rests. But like the feigned Gulf of Tonkin incident that drew the USA into a cruel and crazy and undeclared war, the official story of 9/11 is highly suspect. The 9/11 Commission, by the admission of Kean and Hamilton themselves, was "set up to fail." Even the forthcoming show trial of Khalid Sheikh Mohammed cannot explain all the observations made, including a bogus airport video surveillance tape used to frame the Arabs. In short, President Obama did not learn the lesson of Vietnam: a BIG LIE is not a good foundation for a major foreign policy decision, but a bad omen. In the spirit of US Senators Wayne Morse and Ernest Gruening, who bravely withstood their gullible colleagues' response to the Tonkin hoax, President Obama should seek a truce in Afghanistan and order a new and real investigation of 9/11. Only then can the USA comply with the Taliban's worthy proposal of October 2001: "Show us the evidence that Osama bin Laden did 9/11, and we will deliver him to you." This was the right thing to do then. This is what President Obama must do now. New York, New York * 30 November 2009 Citizen of the USA Stephen M. St. John addresses the international community here in New York and laments the tortuous legal warfare that the Zionists have imposed on John Demjanjuk for more than three full decades. Their rank hypocrisy is summed up in the words of Marvin Hier, Dean of the Wiesenthal Center in Los Angeles: "We should not make the mistake of thinking that a case against one war criminal is a case against just one man. When the bell tolls for John Demjanjuk, it is also tolling for every other war criminal." By this seemingly just standard, one would expect Judge Richard Goldstone's vindication for his investigation of the shock and awe in Gaza this winter past. But the scales of justice seem to have been fixed long ago by the Zionists. Why, for example, has there never been justice done to the Zionist murderers of UN Mediator Count Folke Bernadotte? A 1995 book by Kati Marton, A Death in Jerusalem, makes a very convincing case against Yitzhak Yezernitsky, otherwise known as Yitzhak Shamir, who later became Prime Minister of Israel. Add to this the Zionist bombing of the King David Hotel, which was ordered by another future Prime Minister, Menachem Begin, and carried out by the father of former Foreign Minister Tzippi Livni, very likely with the help of the father of President Barack Obama's Chief of Staff Rahm Emanuel. Marvin Hier is conspicuously silent about these war criminals. No bell tolls for them. Is this right? More than two millennia ago King Solomon said "A false balance is abomination to the Lord: but a just weight is his delight." This eternal truth needs to be applied to the current situation, where Zionists profess a Talmudic license to kill and steal from non-Jews; but rather than being challenged, these same Zionists portray themselves as pious and just. They made the 20th century a nightmare of full spectrum fraud and force, but now meet firm resistance. Ehud Barak, never tried for war crimes during the 1982 invasion of Lebanon, now threatens Lebanon again because he doesn't like the composition of its new cabinet. Had justice prevailed then, the threat of war would now be gone. New York, New York * 16 November 2009 Citizen of the USA Stephen M. St. John addresses the international community here in New York City and urges full recognition of Palestine within borders that existed before the 1967 Six Day War. De Jure recognition of Palestine will anchor any subsequent political compromise in international law rather than the gains and remains of illegal occupation. The law is a shield for the weak, honor for the strong and a remedy for the old colonial formula of divide and conquer. The 15 November 1988 declaration of the State of Palestine has already sealed the deal despite diversionary tactics at Madrid, Oslo, Shepherdstown, Wye, Sharm Ash Sheikh, Annapolis, New York and parts unknown. The late Hugh Foote, also known as Lord Caradon, is considered to have been largely responsible for the final wording of UN Security Council Resolution 242 when he was the UK's Ambassador to the UN. His beautiful prose in a Saudi English newspaper (1982) leaves no doubt it is incumbent on the Zionists to leave all the territory occupied during the Six Day War. All settlements on these lands are illegal. There was no question about this until Ronald Reagan's Department of State overturned the word "illegal" in favor of a more Zionist friendly and ambiguous catch phrase "obstacles to peace," which is the monstrosity that launched and sustained the career of Dennis Ross. To add insult to injury, the Russians let one million "Jews" into the Zionist state rather than leverage them for exercise of the Palestinians' right of return. Their reward was sabotage and breakup, and Palestinians still endure explanations for the expiration of their inalienable rights. The Palestinians' resort to the UN will test this institution's integrity. Between a rock and a hard place, what other way is there to confront the inexorable implementation of "transfer" in apartheid phases? Let the ethnic cleansing endorsed by Herbert Hoover and the Zionist Congress in 1937 give way to respect for basic human rights and international law and a truly comprehensive peace. The violence in the USA exceeds current wartime casualty lists, yet little heed is paid to this fact. A good example is last week's slaughter of 13 members of the US Armed Forces at Fort Hood, Texas. So far, the mainstream news media has not recalled as background to the fresh reports out of Fort Hood the 16 October 1991 mass murder of 23 people in nearby Killeen. Rather than connect these two events, both of which also included many wounded who survived, focus has been exactly where the Zionists want it to be, on the national ancestry and religion of the man who went berserk. The evil, war mongering US Senator from Connecticut, Joseph Lieberman, is exploiting the tragedy to score points for Zionism and convince Americans that we are in a clash of civilizations on the side of the civilized Zionists. Luckily, cooler heads prevail among the generals and field officers who will judge Major Nidal Malik Hasan according to his terrible crimes and state of mind. Of course the catalyst unleashing the toxic ideology of a clash of civilizations was 9/11. But just as Americans are inured to the violence in their midst and actually resort to shows of violence in their daily entertainments, they are as dumb as nails and as used as screws when it comes to 9/11. At our national peril they have swallowed hook, line and sinker a discredited cover story for what actually happened on 9/11. The degraded and degrading news and entertainment industry has dumbed them down to the point where a BIG LIE has been embraced as an article of religious faith. For the past two months I have been stonewalled by the proper authorities after alerting them to the use of a bogus video surveillance tape to frame the Arabs for the shock and awe crimes of 9/11 (See http://www.show-the-house.com/id92.html). Even so, I believe that sooner or later I will be vindicated and treason will be uprooted from our institutions. I also wonder, what salutary effect my vindication would have had on Major Hasan had it come in a timely manner? The genetically engineered onion has been peeled. The 5+1 monstrosity is down to the final three layers confronting Iran at the International Atomic Energy Agency in Vienna; namely, the USA, Russia and France, all acting in synch with the histrionics of the Zionist state after urgent appeals made in private. So the same bad habit of divide, conquer and impose dependency on Iran persists to the detriment of world peace. Externally motivated acts of shock and awe inside Iran add spice to the ultimatum in Vienna. And the Almighty tests those he loves well, and clearly sets proper limits. This exercise in Vienna is conducted to build western confidence in Iran through the proper channels of the IAEA. But shouldn't there also be an equalizing force to hold the west to account? How is it that France passes judgment on Iran after having introduced secret nuclear programs into the Zionist state in violation of the Charters of the United Nations and the IAEA? Or the USA, whose CIA Chief of Couterintelligence, James Jesus Angleton, undermined JFK's adamant opposition to the Zionist state's illegal nuclear weapons program while posing as the poet T. S. Eliot on counterespionage missions in merry England? Or Russia -- the erstwhile USSR -- whose spies in the USA were nearly all dedicated Zionists? Why entrust this friend of your enemy with enriched uranium after Russia has procrastinated so devilishly well with the Bushehr and S-300 contracts? The IAEA has succumbed to Zionist manipulation that should have been deflected to the International Court of Justice where evidence that is fabricated or contrived or secret or speculative will be prevented. Behold, I will kindle a fire in thee, and it shall devour every green tree in thee, and every dry tree: the flaming flame shall not be quenched, and all faces from the Negev northwards shall be scorched by it. And all flesh shall see that I the Lord have kindled it: it shall not be quenched. (Ezekiel 20: 45-49 or 21: 1-5). Having read your recent report, The STL Six Months On: A Bird's Eye View, I wonder what strange bird indeed can promise to reach out to victims of "related attacks" (paragraph 24) when you haven't enough proof to detain your suspects any longer let alone convict them for the assassination of Rafiq Hariri. This statement reflects prejudice and prejudgment on your part and serves as a divisive appeal to emotions after this heinous attack on the heart of Lebanon. And who are the real perpetrators? Are they not the ones who were first to point the finger of blame and exact punishments on the diplomatic and political levels? Have you considered that the Hariri assassination was not a mere terrorist act, but a "shock and awe" act? Do you know the difference? The STL ought to busy itself with defining the ultra-terrorist act of a state sponsored "shock and awe" operation. The real war is against the cruel proponents of this "shock and awe" doctrine. Mr. Cassese, to find the culprits who pulled off the Hariri assassination, look to the praxis of evil espousing the "shock and awe" doctrine and having a prior record of framing Arabs for crimes that they themselves carried out as "false flag" military intelligence operations. Look to the USA, where the discredited 9/11 Commission Report has left a wake of unanswered questions, perhaps to be addressed ultimately by a United Nations 9/11 International Independent Investigation Commission. Those Arab lads were framed for the crime of the century by a corrupt US court system and US Department of Justice. Proof is at http://www.show-the-house.com/id92.html [also reproduced below]. This is just the tip of the iceberg. A pattern emerges which, gladio, points the way to the Hariri assassins. How can the shadow of a passerby outside the main terminal at Dulles Airport be explained? It looks like US Attorney General John Ashcroft framed these Arab lads for the shock and awe crimes of 9/11. 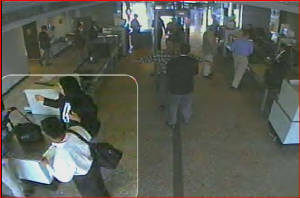 In the photo at right, taken from a video that the US Government offered as an exhibit at the Zacharias Moussaoui trial, you see a 9/11 suspect allegedly at a Dulles Airport security checkpoint at the lower left. A film editor framed the suspect in a box for demonstration purposes. But I draw your attention to the pedestrian just outside the terminal at the extreme top left of the entrance. Note his or her shadow and how it points directly toward the closed circuit television camera (CCTV) filming the alleged hijacker inside the terminal. Note also the angle of the pedestrian's shadow in relation to the thick black stripe that runs along the terminal floor from right below the CCTV and straight to the metal detector. Keep all this in mind as you scroll down. At right is a close-up of the pedestrian outside the terminal. Again, note that his or her shadow points right at the CCTV camera filming the alleged hijacker. Now, we turn to Google Earth for a lesson in geography which will enable us to put the pedestrian's shadow in the right perspective. At left is a photo of Washington Dulles International Airport from 36,000 feet. 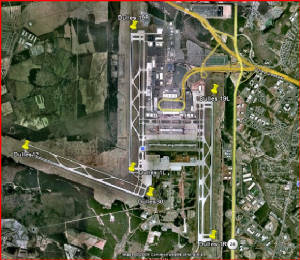 The two main runways are parallel and go north/south, or, at headings of 10 degrees and 190 degrees. These headings are painted in white at the ends of the runways in aviation shorthand 1L and 1R (one left and one right) for jets approaching from the south on a 10 degree heading and 19L and 19R (nineteen left and nineteen right) for jets approaching from the north on a 190 degree heading. Note the airline terminals between the two parallel runways. In a closer image at left, from 13,000 feet, you have a better view of the airport terminals in between the parallel main runways. 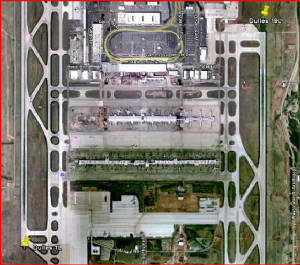 The north and south faces of these terminals are perpendicular to the main parallel runways. As you are about to see, this is an important consideration with regard to the pedestrian's shadow and its angle relative to the thick black stripe on the terminal floor. Now let us make a quick study of the Dulles Airport terminals. As you can see on the terminal map reprinted at right from the Metropolitan Washington Airports Authority website, the flow of passengers for departing flights from Dulles is from north to south, and south to north for those who have arrived from other airports. Please note that the terminal map is upside down, showing the south at top and the north at bottom. 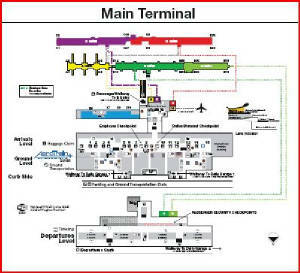 For a better view of the terminal map, click here: http://www.metwashairports.com/dulles/flight_information_3/terminal_map. So you see, in this view of the Dulles Airport terminals from 4,770 feet in the photo at left, the Main Terminal at the center top is where ground passengers arrive for departing flights. They enter the main terminal on the north side, and proceed by foot, moving walkways, shuttle lounges or shuttle buses to their departure gates at the two mid-field terminals. Given Dulles Airport's position relative to the ecliptic, where the sun in Cancer in July reaches the zenith at mid-day, and is low on the southern horizon in Capricorn in January, and at various points in between throughout the year, we know that shadows are never cast by the sun toward the north faces of the airport terminals at Dulles, but only away from them. 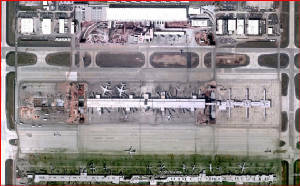 And so, one may conclude, subject to verification in a proper judicial discovery process, that if the north face of the Main Terminal runs perpendicularly to the two main parallel runways 1/19L and 1/19R, then the black stripe painted onto the terminal floor is exactly parallel with the runways as it is also clearly perpendicular to the north face of the terminal. From this one may also conclude that if indeed the passengers for departing flights enter the Main Terminal on its north side, then the shadow of the pedestrian just outside the terminal entrance, which points directly at the CCTV giving us the image, is on a heading of approximately 170 or 180 degrees relative to the thick black stripe on a heading of 190 degrees. From all of this we may conclude that the shadow is cast from a direction where the sun never shines relative to Washington Dulles International Airport. The sun would have to be setting in the north or north northwest in order to cast the shadow seen in the CCTV image. Therefore, the CCTV video is bogus in that it could not have been filmed at Dulles and must have been filmed elsewhere and then fraudulently presented as having been filmed at Dulles Airport on the morning of 9/11. The terminal entrance where the alleged hijackers entered had to have been facing east or southeast for the pedestrian's shadow to be true to the time and place of the event purportedly shown in the video. To the best of my knowledge and belief, and subject to verification in a proper judicial discovery process, there was no entrance facing east or southeast which the alleged hijackers could have used to enter the Main Terminal at Dulles Airport on the morning of 11 September 2001. Given that there is no time indicator shown in the video, and given the strong prima facie case that the video was not filmed at Washington Dulles International Airport, one must consider the strong possibility that certain officials within the US Department of Justice obstructed justice by a calculated presentation of fabricated evidence. Whatever the case, it is perfectly clear that we have NEVER seen ANY credible video surveillance images of ANY of the passengers and alleged hijackers at ANY of the three airports from which the flights of 9/11 are said to have departed. How can this be explained? How could we have invaded Afghanistan and Iraq without even asking this question first? 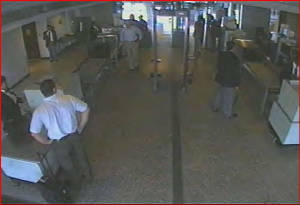 To see the entire "Surveillance videotape from Dulles Airport West Security Checkpoint #1" click http://www.vaed.uscourts.gov/notablecases/moussaoui/exhibits/prosecution.html and then scroll down to Exhibit NT00211 and click. Again, these conclusions are tentative in that they are subject to verification in a proper judicial discovery process. I have not had an opportunity to verify the presented data by direct inspection and interviews with airport authorities. This remains to be done, perhaps under the aegis of a 9/11 International Independent Investigation Commission established and supported by the United Nations. 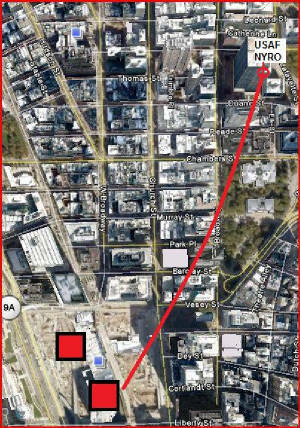 On 21 October 2009, after nearly two months of intermittent faxing and emailing Dulles Airport Shadow casts Doubt on US Government's 9/11 conspiracy Theory, I made a personal visit to the New York Regional Office of the Federal Bureau of Investigation at 26 Federal Plaza on Broadway at Duane Street in Manhattan, less than half a mile from ground zero. There, according to procedure, I completed and deposited a handwritten notice that referred to this article in particular and the need for a new and a real investigation of 9/11 in general. Peace be upon you and greetings from New York City. I am a citizen of the USA who urgently appeals to leaders from around the world to call for a full, fair and impartial investigation into the USA’s doctrine of "Shock & Awe," the events of 9/11 and subsequent cover-up. Your Excellency, we simply do not know the whole truth about 9/11. Rather, we are sure lies have been told and information has been withheld. When you consider the consequences of 9/11, and the logic behind the brutal "Shock & Awe" invasions and ongoing occupations, you must conclude it only makes good sense to discover the root cause. This is a global problem requiring a global solution. Therefore, I implore you to call for a real investigation of 9/11 at the opening of the next United Nations General Assembly later this month in New York. If I can serve as an adviser to your government in this matter, please do not hesitate to contact me. Following this page is a copy of my most recent article on 9/11 with references to other articles as well. Please do avail yourself of this information from the podium of the General Assembly hall. NEW YORK, NEW YORK * 17 June 2009 Citizen of the USA Stephen M. St. John addresses the international community in Washington and here in New York City, all members of the US Congress as well as other organizations and persons, public and private, and congratulates Iranian President Mahmoud Ahmadinejad for his impressive landslide victory in Iran's national election. He has made Iran a force for a just Middle East peace. Furthermore, Citizen St. John commends the Guardian Council for its decision to oversee a limited recount of ballots at specific sites where candidates claim irregularities and he hopes this will be a model for the USA to follow. In Michael Moore's film Fahrenheit 911, official film footage shows a joint session of the US Congress jeering black colleagues who stood to demand recounts in their districts where there was good cause to believe the November 2000 results were fraudulent. Only one senator was required to stand and second their demands, but this did not happen, not even by a senator from their own party. This conspiracy was a very low point in the history of democracy. Tehran's official complaint of intolerable meddling on the part of the USA is perhaps the climax of programs put in operation by George W. Bush's May 2007 directive. See Anti-Defamation's film at http://informationclearinghouse.info/article22839.htm. Violent protests require extreme measures for a country surrounded by US forces. It would seem that if President Obama wants Iran to "unclench your fist," he needs to call home his dogs of war first, and stay out of Iran's internal affairs. There is not one drop of British oil under Iranian soil, but the Brits still have a treasury of their own proverbs, including "Many hands make light work." This explains the swiftness of the count of votes, which was ongoing as the polls opened. Such human orchestration should replace growing reliance on computer tabuation of votes in the USA, which, as demonstrated by James and Kenneth Collier in Vote Scam: the Stealing of America, is open to manipulations in conjunction with the newsmedia. Read An Eight Part Peace Proposal for Greater Jerusalem at http://www.show-the-house.com/id1.html. NEW YORK, NEW YORK * 15 JUNE 2009 Citizen of the USA Stephen M. St. John addresses the international community in Washington and here in New York City, all members of the US Congress as well as other organizations and persons, public and private, and regrets Israeli Prime Minister Netanyahu's speech on Sunday at Bar Ilan University because of its utter disregard for international law and shameless attempt to shift blame. Former President Carter noted that the settlements in occupied territories were illegal during his administration (1977 to 1981) and today they remain in violation of United Nations Security Council Resolution 242 which was passed in November 1967. Ronald Reagan turned the law upside down and lip service has ever since been paid to illegal settlements as "obstacles to peace." Actions rather than words indicate a plan for ethnic cleansing in gradual phases of apartheid confinement. As far back as 1937 former President Herbert Hoover advocated "transfer" of Palestinians to make room for the Zionists as did the Zionist Congress in Basel, Switzerland. Netanyahu's reference to the "root of the problem" simply sidesteps these inconvenient pre-World War II facts, which in the simplest of terms mean ethnic cleansing. The upshot is that Jews cannot be allowed to have more than a homeland in a state for all its citizens. The Zionists' notion of separateness is not rooted in the Torah and this is where the problem lies. According to Moses the separateness of the Israelites is purely spiritual as shown in Exodus 33:16. Zionism's erroneous concept wastes lives and energy. Netanyahu's reference to "our prophets" and "our forefathers" takes us to the source of all the confusion. The Ashkenazi Jews are not of the blood of Abraham but rather a Turkic people descended from Khazars who converted to Judaism in the Middle Ages. After more than 60 years in Palestine they lack the prophesied blessings of a king, a temple and the Almighty's covenant of peace. History shows the Khazars are the prophesied Gog at http://www.show-the-house.com/id55.html. NEW YORK, NEW YORK * 4 June 2009 Citizen of the USA Stephen M. St. John addresses the international community in Washington and here in New York City, all members of the US Congress as well as other persons and organizations, public and private, and seeks to tweak President Obama's impressive speech today in Cairo, Egypt. Obama said, "America's strong bonds with Israel are well known. This bond is unbreakable. It is based upon cultural and historical ties, and the recognition that the aspiration for a Jewish homeland is rooted in a tragic history that cannot be denied." To the contrary, in 1937, well before the Shoah, the Zionist Congress in Basel, Switzerland formally adopted the policy of "transfer" of Arabs from Palestine. Also in 1937, ex-President Herbert Hoover actively advocated this policy of ethnic cleansing, which is essentially part of the old colonial formula of divide and conquer. Obama also said, "Palestinians must abandon violence." But he should have made the same demand of the Zionists, who to this day celebrate their terrorism, including the bombing of the King David Hotel, where a few Jews were among the many killed. More recently the Zionists attacked and killed six in Gaza on Election Day in the USA, 4 November 2008. This provocation, leading to even greater slaughter, was blacked out in the USA. Both Bush and Obama failed to condemn it. To his credit, Obama repeated the Golden Rule, "There is also one rule that lies at the heart of every religion - that we do unto others as we would have them do unto us." But he still needs to learn the Platinum Corollary of the Golden Rule, "We know what they have done to us; what have we been doing to them?" A State of Jerusalem with one citizenship, one capital and one law, and with a king and sanctuary in their rightful places, is mankind's best hope for the Almighty's covenant of peace. See An Eight Part Peace Proposal for Greater Jerusalem at http://www.show-the-house.com/id1.html. "This offense is a grave one that implicates the national security of the United States. Why it took the government 23 years to charge Mr. Kadish is shrouded in mystery. It's clear that the government could have charged Mr. Kadish with far more serious crimes." In this case, it is also clear that the judge's leniency was due to Kadish's age and health and nothing more. But how indeed can the 23 year lapse be explained? Much of the winking at crime in the judicial, law enforcement, intelligence and news & entertainment communities in the USA can be attributed to the Talmudic Law of the Moser, whereby a Jew cannot inform on another Jew to a non-Jew directly or indirectly. Like the Mafioso Code of Omertà, the Law of the Moser cannot be dealt with if it is not acknowledged. A few examples will illustrate profound losses incurred by the American people by rampant resort to the Law of the Moser gone unchecked. Warren Commission Counsel Melvin Eisenberg danced legal circles around the serious implications of the testimony of Ronald Simmons, who tested the rifle allegedly used by Lee Harvey Oswald. The scope was not properly aligned and therefore was useless until adjustments were made in the machine shop. JFK's opposition to the Jewish state's nuclear weapons program was removed, and Oswald was blamed. Examining Judge Y. Yerushalmi, in a "preliminary report" on the Jewish state's attack on the USS Liberty, blackmailed LBJ with exposure of illegal submarine activity in the event of a full inquiry, and taunted that "considerations of the credibility of witnesses should not be part of my functions"! Thus did American blood seal the taking of the Golan 1 2 3. Now discovery of evidence of controlled demolitions of three WTC towers is blocked by those who'd put and keep American muscle on Mesopotamian Patrol, which is "good for Israel" per Netanyahu. Learn more about the Talmudic Law of the Moser at http://www.show-the-house.com/id10.html. Visit Fax Broadcasts at http://www.show-the-house.com/id8.html including links shown above. Internet Explorer is best for this page. WATERBOARDING IS TORTURE. DOING 9/11 TO START WAR IS DECEIT. BOTH ARE CRIMES! NEW YORK, NEW YORK * 28 May 2009 Citizen of the USA Stephen M. St. John addresses the international community in Washington and here in New York City, all members of the US Congress as well as other persons and organizations, public and private, and once again cites Holy Scripture as proof that waterboarding is torture because the technique can readily lead to suffocation by drowning. In the Second Book of Kings, chapter 8, verses 7-15, the prophet Elisha foretold the death of Ben-hadad, King of Aram (the Biblical name for Syria), who soon thereafter "took a thick cloth, and dipped it in water, and spread it on his face, so that he died." Judeo-Christian sages are fully apprised of the efficacy of this method. Former US Attorney General Mukasey could not call waterboarding torture because doing so would have been tantamount to condemning fellow Zionists who have used this torture technique, among many others, against the people of Palestine for decades. A moral stand against such inhumane treatment would be a clear violation of the Talmudic Law of the Moser, which prohibits a Jew from informing on another Jew to a non-Jew directly or indirectly! Bush got a free ride with Mukasey! Americans are still far from figuring out how the values of Mukasey's Ashkenazi Khazar tribe have come to plague them with its ideology of separation by force and superiority by fraud. Perhaps the testimony of chief interrogator Matthew Alexander, who refutes the psychopath Richard Cheney's defense of torture, will awaken them. The Bush Administration's record on torture, and the discovery of military grade nano thermitic explosive residues in a set of dust samples provided by local residents near Ground Zero at the World Trade Center (See http://www.youtube.com/watch?v=8_tf25lx_3o), constitute good prima facie evidence of war crimes in violation of the Nuremberg Principles and Geneva Conventions. Ample evidence awaits trials at the Hague for unjustified initiation of aggressive wars and for wrongful conduct by individuals constituting the leadership and military personnel of the USA. Who are the Ashkenazi Khazar Jews? Isn't it about time you found out? Visit http://www.show-the-house.com/id55.html. HOLY APARTHEID!?! WHAT WOULD JESUS DO?!? NEW YORK, NEW YORK * 21 MAY 2009 Citizen of the USA Stephen M. St. John addresses the international community in Washington and here in New York City, all members of the US Congress as well as other persons and organizations, public and private, and challenges the central belief of the militant right wing Zionists that the Almighty God who created this world and all other worlds from the beginning of the beginning intends for them to live separately in what their critics rightly say is an exclusively Jewish apartheid state. People of all faiths or of no faith at all deserve to know and understand how the Talmudic Zionists depart from the Torah, the very basis of their professed faith and their "right to exist." Here's the plain truth on what the word of the Almighty reveals about his peculiar, chosen people. Yes, they will be separate, but that separateness is not defined in physical terms of a desert camp, ghetto, shtetl or sovereign state. That separateness is explicitly defined by the Almighty and affirmed by Moses in the Book of Exodus, Chapter 33, verses 14 - 16, right after the Mount Horeb Golden Calf incident and right before the bestowal of the Ten Commandments. 16 For wherein shall it be known here that I and thy people have found grace in they sight? is it not in that thou goest with us? so shall we be separated, I and thy people, from all the people that are upon the face of the earth. So the Almighty's presence alone is what distinguishes the people of Israel from all other people, and they in turn will be known by their Sabbath keeping. Just as Abraham lived confederated with other peoples in the same land, so too can the blood and blessed of Abraham do likewise. True separateness will flower in an integrated state comprising all the people west of the Jordan river. EUROPE WAKE UP! "OUR GOVERNMENTS," USA & JEWISH STATE, ARE TILTING IN THE LISTS! NEW YORK, NEW YORK * 19 MAY 2009 Citizen of the USA Stephen M. St. John addresses the international community in Washington and here in New York City, all members of the US Congress as well as other persons and organizations, public and private, and urges Europe to remember the 1937 Zionist Congress in Basel where the policy of "transfer" of Palestinians was formally adopted even as then ex-President Hoover made speeches calling for this ethnic cleansing. What we have seen, and what we are now seeing, is realization of this criminal goal in apartheid phases. Saying settlements violate the principles of the Quartet hides the reality that they violate 1967's UNSC Resolution 242, all with the help of the USA. Now President Obama is in conflict with PM Netanyahu over the Quartet's two state solution. And, powerless to enforce a separation of synagogue and state, Obama is also in conflict with Abu Mazen over the idea of an "independent Jewish state" in his homeland. Upon AIPAC's instructions, House Democratic Majority Leader Hoyer and Republican Whip Cantor pledge that "our Governments" will work "closely and privately" yet expect to be accepted as trusted mediators. These swell fellows grant that the disputing parties have a role to play, as they must live with their decisions, cancelled elections notwithstanding. It's beginning to look a lot like business as usual. The sanest idea came from Secretary General of the Arab League Amr Musa, who rose above rejection of the Arab initiative and the two state solution by referring to one integrated and democratic state west of the Jordan river. This is the very same goal of my 32 year old An Eight Part Peace Proposal for Greater Jerusalem. With territorial adjustments inspired by and modeled after the only provision in the Constitution of the USA never yet exercised since ratification in 1788, this plan offers a unique and original way to establish Palestinian unity in particular and Arab unity in general. A clearly defined end result can be agreed upon and then achieved. This plan is comprehensive on all fronts, and makes the Middle East free of nuclear weapons per JFK's vision. Please read An Eight Part Peace Proposal for Greater Jerusalem at http://www.show-the-house.com/id1.html. ERSATZ ISRAEL IN ERETZ ISRAEL: KNOW YOURSELVES AND CHANGE YOUR WAYS! "The critical juncture will be what comes out of the Obama-Netanyahu meeting. If there is procrastination by Israel on the two-state solution or there is no clear American vision for how this is going to play out in 2009, then all the tremendous credibility that Obama has worldwide and in this region will evaporate overnight if nothing comes out in May. All eyes will be looking to Washington in May. If there are no clear signals and no clear directives to all of us, then there will be a feeling that this is just another American government that is going to let us all down." Of course the alternative is war, which the western plutocracy has favored again and again as the Jewish state repeatedly flouts international law. The old colonial formula of divide and conquer, whether it be on a regional basis or focused locally on the people of Palestine, works in tandem with the false Talmudic ideology of separateness and superiority and freedom to commit atrocities with impunity. On the other hand, the real Israel will be known by a king, a temple and a covenant of peace according to the prophet Ezekiel. The Zionist state lacks all three, and the reason for this is that the dominant Ashkenazi Jewry are impostors identified by the historical record and through Scripture as Gog. This is the real burden of the people of Palestine and of all peace-loving people around the world. For more information, see http://www.show-the-house.com/id55.html. The Arab-Zionist dispute has, under the tyranny of George W. Bush, evolved into an Iranian/Arab-Zionist dispute, and any attempt to find a truly comprehensive peace which ignores this fact will not succeed. The Zionists will either accept Iran as a peace partner or use Iran as an excuse to buy a few more decades of business as usual. Their fortress mentality needs change. An Eight Part Peace Proposal for Greater Jerusalem is a truly comprehensive peace plan for all fronts of the Iranian/Arab-Zionist dispute. Visit http://www.show-the-house.com/id83.html and scroll to 10 July 2006 (Best viewed with Internet Explorer). Citizen of the USA Stephen M. St. John addresses the international community in Washington and here in New York City, all members of the US Congress as well as other organizations and persons, public and private, and notes that 6 May 2009 marks the 28th anniversary of the unacknowledged sabotage of a US Air Force EC-135N, and perhaps another missed opportunity to understand this event as a precursor of future electronic black operations including EgyptAir 990 and 9/11. The EC-135N was a military version of the Boeing 707 and functioned like an AWACS but with the satellite dish housed in a protruding nose cone reminding one of the cartoon character Snoopy. 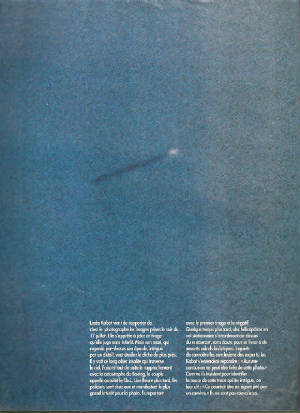 On 6 May 1981 one went down in a totally inexplicable nose dive to the northeast of Frederick, Maryland, near Walkersville. Sabotage by remote control still needs to be ruled out, as argued at http://www.show-the-house.com/id9.html, which includes a link to the executive summary of the US Air Force investigation. 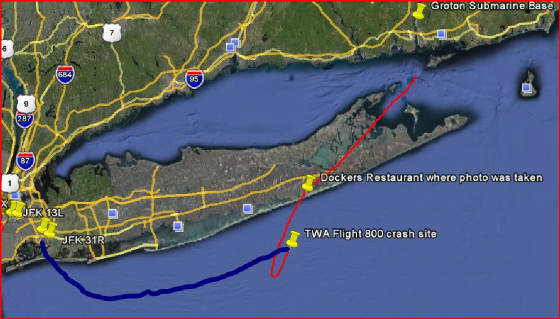 There the elements suggesting electronic sabotage are highlighted, including anomalous transponder beacon returns in the seconds before contact was lost as the jet abruptly entered into a nose dive. For good measure, and apparently as a backup against failure in the electronic sabotage mechanism, an explosion occurred inside the fuselage near the end of the jet's rapid descent, when manual recovery by the pilot was already impossible. At the time of this sabotage, enormous pressure was on the Reagan Administration to reconsider a proposed arms package to Saudi Arabia which included AWACS jets. This might explain why the man who led the investigation, Brigadier General Robert E. Chapman, did not make a criminal referral of his findings. Then Senator Joseph Biden led the AIPAC screamers against the Saudi arms package when he should have been calling for a Congressional investigation into Chapman's disturbing findings. This kind of politics is toxic to our national interest, and has grown exponentially over the decades. No better case can be made of a praxis of evil in our midst. Visit http://www.show-the-house.com/id9.html and read USAF EC-135N & EGYPTAIR Flight 990: Precursors of Remote Controlled Flights of 9/11? A LESSON IN STATECRAFT: THE OTHER SHOE WILL NOW DROP! NEW YORK, NEW YORK * 28 April 2009 Citizen of the USA Stephen M. St. John addresses the international community in Washington and here in New York City, all members of the US Congress as well as other persons and organizations, public and private, and notes two predictions on the economy which are polar opposites; namely, New York State Budget Director Laura Anglin's estimation that the national recession will end sometime in the third quarter of 2009 and political economist Lyndon LaRouche's dire forecast of a crumbling US economy causing shockwaves around the world in the near future. Which of the two is telling us the truth? Anglin's reputation as an economic forecaster is unknown to this writer, whereas LaRouche, who has no political masters, has been hitting the bullseye for decades now. After the economic assault on the USA in mid September 2008, and the subsequent failures and bailouts of renowned financial institutions, perhaps the time has finally arrived for more citizens of the USA to give respectful heed to LaRouche's ideas, which are steeped in historical context, incisive analysis and keen awareness of the problems people now face. A debate between Anglin and LaRouche would clarify reality. Anglin's hopeful outlook rests on working with the same old monetary system that helps private interests first. But LaRouche maintains that the very architecture of this old monetary system must be transformed into a governmental credit system, which is in line with the letter and spirit of the Constitution of the USA. Issuing money is an act of state according to our law of the land, but this power was supplanted long ago by a derivative mutation of the old Venetian system that kept empires breathing heavy for over a millennium in Europe. President Obama can thrust a stake into the heart of this Dracula by introducing an international fixed rate credit and exchange system as a coordinated effort of sovereign equals among sovereign equals with no Crazy Eddies in between. Visit http://www.show-the-house.com/id52.html and consider corporate advertising on legal tender as a means of introducing a government credit system. The ultimate goal of "transfer" of Palestinians actually predates Hitler's rise. "Cruel and crazy" are the words Britain's Lord Caradon (Hugh Foote) had for the Zionist occupation in defiance of UN Security Council Resolution 242, the final wording of which he helped hammer out in November 1967 when he represented the UK at the UN. More than four agonizing decades later, Ahmadinejad is unfairly castigated for saying basically the same thing. Shame on those who defied this "uppity wog" who has the courage to stand on principle against the arrogance and oppression, against the full spectrum fraud and force of a certain few leaders among the assembly of nations! By following Iran's example, a Middle East free of weapons of mass destruction can be attained as an integral part of a truly comprehensive peace settlement. The only obstacle to this logical step is the psychopathic right wing of the political establishment in Tel Aviv. The truth of 9/11 is nipping at their heels, which makes the war option against Iran more desirable if only to divert attention. But their final undoing will most likely be in the Caucasus, from whence these troublemakers came. The Ashkenazi Khazar-descended Jews who represent most of world Jewry today are a Turkic people who converted to Judaism around 740 A.D.. In Bible prophecy they are known as Gog and Magog, in contradistinction to the real Israel, who will be known by the blessings of a temple, a king and a covenant of peace according to the prophet Ezekiel. This Ersatz Israel will not be forever. Visit http://www.show-the-house.com/id55.html and read Ersatz Israel: On those who call themselves Jews but are not (recently updated with a new link to an Islamic perspective on Gog and Magog). NEW YORK, NEW YORK * 16 APRIL 2009 Citizen of the USA Stephen M. St. John addresses the international community in Washington and here in New York City, all members of the US Congress as well as other organizations and individuals, public and private, and urges the Obama Administration to undertake a course of self-criticism with respect to its sincere desire for rapprochement with Iran. For starters, the USA must confess and atone for the 1953 overthrow of the democratically elected Mossadegh regime by violent force and fraud. How will the USA make amends for such a gross violation of Iran's sovereignty and internal affairs as well as our United Nations treaty obligations? What current programs exist to undermine Iran again? How and when will they be stopped? Second, what about Iran's nuclear programs under the Shah? Projection is a term in psychology denoting an unconscious defense mechanism whereby a person or even a nation attributes his, her or its own praxis of evil to another person or nation. Was the USA the first to introduce nuclear weapons in the Middle East by providing them to the Shah? Does the USA have more secrets to explain about nukes in the Middle East than Iran? Is the USA projecting its own sordid record on Iran with excessive demands based on secret evidence? Aren't the warlike sanctions hypocritical? On 29 May 1995 Shimon Peres told Larry King and his worldwide audience about the Zionist state's 1956 nuclear pact with France. Even so, this subject remains taboo, which is unfair not only to Iran, but to the democratic process in the USA. Now Peres is making illegal threats against Iran because this great nation resists the injustices of the old colonial formula of divide and conquer in Palestine and the surrounding region. But wouldn't it be a far better idea to include Iran in what is now the Iranian/Arab-Zionist dispute? Part VIII of An Eight Part Peace Proposal for Greater Jerusalem calls for a Middle East free of weapons of mass destruction as an essential component of the solution. WILL GEORGE H. W. BUSH CARRY SECRETS OF JFK ASSASSINATION TO HIS GRAVE? NEW YORK, NEW YORK * 6 APRIL 2009 Citizen of the USA Stephen M. St. John addresses the international community in Washington and here in New York City, all members of the US Congress as well as other organizations and individuals, public and private, and notes a sly manipulation of the historical record in the recently released book, Family of Secrets, by Russ Baker (New York, New York: Bloomsbury Press, 2009). On page 59 Baker asserts without any evidence whatsoever that George H. W. Bush, after having flown back to Dallas from Tyler, Texas on the afternoon of 22 November 1963, "left again almost immediately on a commercial flight to Houston." Such a ploy by an otherwise seemingly meticulous researcher is a dodgy way to steer readers from conclusions made in Citizen St. John's letter of 31 January 2005 to then Chief Justice of the United States William H. Rehnquist, copies of which were faxed to all members of the US Congress, some of whom gave interesting replies, with some signed by hand. See http://www.show-the-house.com/id6.html. There is no evidence that Bush did not stay overnight in Dallas on 22-23 November according to the advice he gave the FBI earlier that day. As shown in the Letter to Rehnquist, both George H. W. Bush and Jack Ruby were engaged in the promulgation of Lee Harvey Oswald's false and misleading public persona as a pro-Castro agitator. The implications of the Bush/Ruby spin on Oswald go to the heart of the matter, and Mr. Baker apparently doesn't want to go there, and finds it convenient to fabricate an alibi for Bush by saying without proof that Bush went home to Houston that Friday afternoon. Lurking in the background, of course, is the CIA's then Chief of Counterintelligence and "Israel Desk," James Jesus Angleton, who opposed JFK's policy of a nuclear weapons free Middle East and also kept track of Oswald. The Angleton/Eliot Same Man theory gives a quantum leap to our understanding of the JFK assassination and the Jewish state's nuclear weapons program. Better understanding of history will best illuminate our future and support President Obama's call to eliminate WMDs worldwide. Visit http://www.show-the-house.com/id35.html to buy historic Schlesinger letter, the first notable reference to the Angleton/Eliot Same Man Theory, which was later confirmed by former CIA Director Richard Helms in his autobiography. NEW YORK, NEW YORK * 19 March 2009 Citizen of the USA Stephen M. St. John addresses the international community in Washington and here in New York City, members of the US Congress as well as other organizations and individuals, public and private, and points to the grand scale fraud that accompanies the force behind British Prime Minister Gordon Brown's world view. The issue surpasses secret evidence against Iran. On his recent White House visit, Brown presented to President Obama a desk pen holder carved from the wood of HMS Gannett, a ship that patrolled against the slave trade in the 19th century. Obama was unwisely impressed and placed the gift on his Oval Office desk, which is made of wood from the HMS Gannett's sister ship, the HMS Resolute. Obama needs to consider that the HMS Gannett actually patrolled against certain competing slave traders, and Great Britain supported the Confederacy, particularly through Jewish bankers in Liverpool, who would lend Richmond money against future harvests of cotton for England's mills. Of course these future harvests of cotton were to be delivered by the blood, sweat and tears of African slaves. So Gordon Brown's gift shows deviousness and a condescending attitude toward the most recent American custodian of our "special relationship" with the United Kingdom. Our next assignment is to bomb Iran for the Zionists. Liverpool has had more negative influence on the USA than most Americans know or can imagine. Within months of the JFK assassination, the "Fab Four" Beatles helped unleash the drug culture from which America has yet to recover. The preposterous findings of the Warren Commission were to be echoed decades later by the 9/11 Commission, which banked on the people's rank stupidity. Predictably, the unjustified and immoral invasions of Afghanistan and Iraq have only increased the drug trafficking, which the Taliban had successfully reduced. The reality is the UK led us into these wars. Rupert Murdoch's cartoonists, like Pharaoh's magicians, made Blair Bush's poodle, when the opposite was true. And now Gordon Brown wants the Mena Arkansas Drug Cartel to take out Iran. Visit http://www.show-the-house.com/id1 to read An Eight Part Peace Proposal for Greater Jerusalem, which gives the correct temple site as well as a unique mechanism for conflict resolution. NBC SATURDAY NIGHT LIVE SKIT HITS NERVE; SHOULD HILARY PRESS "RESET" OR "OVERCHARGE"? NEW YORK, NEW YORK * 11 MARCH 2009 Citizen of the USA Stephen M. St. John addresses the international community in Washington and here in New York City, members of the US Congress as well as other organizations and individuals, public and private, and recommends a good look at NBC's Saturday Night Live Skit on the Bush Administration's "bailout." The powers that be pulled the skit from the Internet, but missed the only unedited version at http://msunderestimated.com/SNLBailoutSkit.wmv. If this skit is "anti-Semitic," what, then, is the looting of the US economy in September 2008? Is this not economic warfare? Like 9/11, which Benjamin Netanyahu more than once called "good for Israel," our economic crisis seems to have benefited many of our most prominent Zionist Buddies. Perhaps it is time for our Secretary of State, Hilary Clinton, to present Tel Aviv with a "Reset" button to usher in a new approach with new ideas for making comprehensive peace on all fronts of the Iranian/Arab-Zionist dispute. Of course Hilary can also present Shimon Peres with an "Overcharge" button for nostalgia's sake and as an indicator that the corrupt, parasitic Zionist/US relationship has ended. For the Arabs, an "uj-bor" (reset) button from Hilary ought to herald a clean break from the old colonial formula of divide and conquer, with Syria unifying Palestinian factions and with Iran and Israel jointly monitoring all nuclear programs throughout the Middle East in conjunction with the IAEA. And a "golly" (overcharge) button from Hilary will signal restitution from the Zionists who murder and steal land with impunity, and from the USA, which from the days of Hoover has promoted "transfer" or ethnic cleansing in apartheid phases, and from the Brits, who did not deign to consult the Arabs with respect to the Balfour Declaration. And the only provision in our Constitution of the USA which has never yet been exercised offers a model legal mechanism for conflict resolution. This truly democratic idea from Philadelphia in 1787 is the essence of An Eight Part Peace Proposal for Greater Jerusalem, which can be read at http://www.show-the-house.com/id1.html. Visit http://www.show-the-house.com/id55.html and find out about the Khazar descended Ashkenazi "Jews" and how the USA, the real Israel, has put its money on the wrong horse, an ersatz Israel! MOMA MIA! ETHNIC CLEANSING WITH DUAL USE PASTA? PASS THE PSYCHO SAUCE! NEW YORK, NEW YORK * 5 MARCH 2009 Citizen of the USA Stephen M. St. John addresses the international community in Washington and here in New York City, all members of the US Congress as well as other organizations and individuals, public and private, and notes with dismay a recent report by the US Campaign to End the Israeli Occupation (http://www.endtheoccupation.org/) that the Zionists are withholding pasta from the starving people of Gaza because the pasta could have a dual use to wage war against the Zionists. The lack of any expression of outrage from the US Department of State over the Zionists' psychopathic behavior does not augur well for comprehensive peace in the Middle East. This attempted genocide of the Palestinians in Gaza is best understood in its historical context. In 1937, former President of the USA Herbert Hoover actively campaigned for the "transfer" of Palestinian Arabs out of their homeland to make room for the Khazar descended Ashkenazi "Jews" who wanted to live there. In that same year, 1937, the Zionist Congress met in Basel, Switzerland, and formally adopted this very same cruel and crazy policy of "transfer." Of course, "transfer" is a euphemism for "ethnic cleansing." All the divided Palestinians are victims of this demented ideology rooted in the Talmud. Implementation of ethnic cleansing is done in phases that have been accurately described as apartheid by another former President of the USA, Jimmy Carter, in 2006. So the Zionists' attempt to rid Palestine of Palestinians preceded the German attempt to rid Germany of the Jews who had been waging economic warfare against them. Ironically, just a few years before, in 1934, William Randolph Hearst, then considered "presidential timber," travelled to Germany to visit Hitler and intercede with him on behalf of the Jews. For his trouble, the Jews attacked Hearst upon his return to the USA. They and the British were behind the "greatest movie ever made," Citizen Kane, which was a libel against Hearst to keep Roosevelt in power and the next war on schedule. Destroy this praxis of evil and Jews will live peacefully in a state for all its citizens. WHAT BACKS THE BRITISH POUND? IRANIAN OIL? NAH! STRETCHABLE TAFFY? YEP! NEW YORK, NEW YORK * 26 FEBRUARY 2009 Citizen of the USA Stephen M. St. John addresses the international community in Washington and here in New York City, all members of the US Congress as well as other organizations and individuals, public and private, and notes IRNA's report that the British government has praised the new policy adopted by US President Barack Obama in wanting to engage with Iran but has yet to switch to a less confrontational approach itself with regard to its relations with Tehran. Indeed, it is the UK's Foreign Office Minister for the Middle East, "Bill" Rammell, and not the Obama Administration, who has just articulated the Giancana Doctrine: "Don't ever forget that I'm the justice of the peace. If they do what I want, we'll take care of them. If they don't, well, we'll take care of that too." Named after the Chicago based Mafioso, Sam Giancana, the Giancana Doctrine has been the essence of US foreign policy long before it officially replaced the Monroe Doctrine; that happened when the USA OKed the UK in the Falklands in 1982. But what is a Brit doing declaring the Giancana Doctrine? Why is Rammell repeating the old carrot and stick party line with regard to Iran while in the same breath saying "We very much welcome the US Administration's willingness to engage directly with Iran"? What 3 + 3 or 5 + 1 offer can be called "very generous" if it violates the sovereign right of any nation? How can the threat of "expanded sanctions" rest on claims totally devoid of evidence? Inasmuch as sanctions are a form of warfare causing real damage and usually leading to armed aggression, why isn't Rammell's bluster comdemned as a war crime? Will Barack Obama take the UK's cue, or go his own way? How can the UK & USA persist for so long with their ineffective approaches to Iran's nuclear program? When are bad faith representations finally rejected? The UK must admit its bottom line: The UK is broke, has no Iranian oil and only stretchable taffy backs the pound. Visit http://www.show-the-house.com/id52.html and learn how mind over matter, mind over money and mind over deficit can be achieved by corporate advertising on money. Money is an act of state! My own observations, and those of my colleague and other competent eyewitnesses, corroborate the independent findings of the late Colonel Donn de Grand Pre's group, that the attacking jets of 9/11 could only have been flown by remote control. These findings, which were put into the hands of members of the Joint Chiefs of Staff within weeks of 9/11, were not considered at all by the 9/11 Commission. COMPREHENSIVE PEACE OR SEPARATE PIECES IN THE MIDDLE EAST. CHOOSE! New York, New York * 17 February 2009 Citizen of the USA Stephen M. St. John addresses the international community in Washington and here in New York City, all members of the US Congress as well as other organizations and individuals, public and private, and once again points to the Realpolitik in the Middle East as reflected in the taboo subject of the Zionists' deliberate attack on the USS Liberty during the June 1967 Six Day War and the hopelessly corrupt administration of Lyndon Johnson. The USS Liberty in 1967 was a state of the art electromagnetic surveillance ship that could gather all electronic signals in the ether and transmit them to the National Security Agency in real time. In this way, raw intelligence would bypass many steps in the normal collection process on the ground, where information could more easily be filtered to shape results. And so, what the Zionists and newspapers in the USA called a "miracle" capture of the Golan Heights might have been seen in a different light by NSA analysts had the USS Liberty not been attacked and could still monitor events. And the taking of the Golan in less than 24 hours certainly looks suspicious. The Golan Heights was a well fortified defensive position called the "Little Maginot Line." There were concrete reinforced bunkers one behind the other. Surely such an operation should have taken much more time to complete. A red flag is raised when you consider Hafez al Asad, the Syrian Defense Minister at the time. Two years after the taking of the Golan 1 2 3, Asad became the only man in world history to lead his nation after losing a significant portion of it's sovereign territory. Think about that! Young Bashir was out of the loop, but his father's right hand man Abdel Halim Khaddam grew rich the good ol' Texas way and is now the USA's King of Syria-in-waiting in France. The Syro-Zionist secret deal undermines international law. Full disclosure can remove this obstacle. The release of political prisoner Khalil Mustafa would be a first step. His book, The Fall of the Golan, tells all. See photo of front cover on next page. And read more at http://www.show-the-house.com/id5.html. Visit http://www.show-the-house.com/id5.html and read USS Liberty: the Missing Piece of the Middle East Peace Puzzle. In my previous letter I explained how the late Colonel Donn de Grand Pre established remote control as the only possible explanation for the highly unusual flight paths of at least two of the four flights of 9/11. De Grand Pre did this within a week of 9/11, yet the expert testimonies that he gathered were ignored and suppressed in favor of the illogical official conspiracy theory. US AMBASSADOR TO IRAN: MOI?!? Citizen of the USA Stephen M. St. John addresses the international community in Washington and here in New York City, all members of the US Congress as well as other organizations and individuals, public and private, and in light of President Barack Obama's search for "openings" for "face-to-face" talks with Iran, states his availability and proximity to the right address. A "relationship of mutual respect and progress" must begin with acknowledgement of the USA's overthrow of Iran's democratically elected government in 1953, which was part of a still on-going pattern in its foreign policy. Can Citizen St. John look the Iranian Ambassador in the eye and say this criminality is finally at an end? Also, Citizen St. John reiterates his Angleton/Eliot Same Man theory, confirmed by former CIA Director and Ambassador to Iran Richard Helms, and suggests as a starting point for Middle East peace negotiations -- including Iran as a principal -- a thorough consideration of how CIA Counterintelligence Chief James Jesus Angleton, posing as T. S. Eliot on counterespionage missions in London, circumvented JFK's wise policy of a nuclear weapons-free Middle East. As for Washington's wish for Iran to "act differently," does this wish depend upon US combat units leaving countries bordering Iran to the north, south, east and west? With respect to the Taliban's success in eradicating narcotics production in Afghanistan before 9/11, will the Obama Administration make a clean break from the Mena Drug Cartel? And with regard to the Taliban's offer to deliver Osama Bin Laden if good prima facie evidence linking him to 9/11 is presented by the US Government, will BHO show ANY credible airport video surveillance of ANY of the passengers OR hijackers at ANY of the three airports from which the flights of 9/11 are said to have departed? Will BHO explain to the Taliban how 9/11 cell and air phone calls were reportedly made when such calls were technically not possible from jets at cruising speeds and altitudes? Wouldn't 9/11 truth be cheaper than 30,000 more troops in Afghanistan? Will BHO cancel his appointment of Leon Panetta to head the CIA now that he knows Panetta and the Iraq Study Group grossly distorted the true number of civilian contractors and mercenaries in Iraq? Were they cover for Zionist false flag operations there? Visit http://www.show-the-house.com/id1.html and learn how an untested idea of our founding fathers can help bring peace to the Middle East! Also, Google 1937 Herbert Hoover transfer Palestine and think about it! 1937! The recently deceased Colonel Donn de Grand Pre (requiescat in pace!) convened a private symposium of military and commerical aviation professionals from 16 to 19 September 2001 and reported the group's unanimous conclusion to the Joint Chiefs of Staff: the aerial vehicles could not have been flown by flight students on their maiden voyages in big jets. From day one, certain people knew these flights were beyond the capabilities of even seasoned pilots. But rather than eliciting their testmonies and analyses, we have drifted along in a conspiracy of silence with devastating consequences for millions of innocent people. Visit http://www.show-the-house.com/id70.html for Donn de Grand Pre interview and obituary. NEW YORK, NEW YORK * 1 February 2009 Citizen of the USA Stephen M. St. John addresses the international community in Washington and here in New York City, all members of the US Congress as well as other organizations and individuals, public and private, and calls for profound changes in US foreign policy including an end to blind support for the Jewish state and a separation of synagogue and state equal to traditional separation of church and state. In lieu of donor conferences for Muslim victims of chronic, full spectrum fraud and force, Citizen St. John looks with favor upon 20% "Green Light" tariffs imposed worldwide on all transactions involving the US dollar and UK pound so as to build restitution funds. Citizen St. John repeats Iranian President Mahmoud Ahmadinejad's call for the withdrawal of US troops from around the world and the beefing up of multilateral forces for lawful intervention and peacekeeping duties headquartered at Governors Island in New York harbor. This historic site, a symbol of the USA's evolutionary growth and remarkable destiny, can be the formal headquarters of the UN's Military Staff Committee as well as a ready campus for an international military academy. See http://www.show-the-house.com/id64.html. Ahmadinejad rightly said, "Change means giving up support for the rootless, uncivilized, fabricated, murdering ... Zionists and letting the Palestinian nation decide its own destiny." Indeed, the USA is bound in servitude to the Talmud Khazar-descended Zionists who call themselves Jews but are not of the blood of Abraham. See "Ersatz Israel" at http://www.show-the-house.com/id55.html. The truth will set us free, and worldwide healing will begin with these psychopaths. The UN must serve the community of nations and not be a one world government. President Obama's statement to Muslims, "we will extend a hand if you are willing to unclench your fist," begs the question, whose fist has really been clenched all along? Whose military budget overthrows regimes, cancels elections, installs and backs dictators, sells weapons, routinely kills civilians, poisons diplomatic relations, imposes sanctions and makes false accusations based on secret evidence? Who has had severe narcotics abusers holding the reins of government for decades? Whatever the case, fundamental change, as opposed to shifts in tactics, will lead to peace. As for the Jewish state, its only threat is the truth, and 9/11 truth will prove to be its undoing. Visit http://www.show-the-house.com/id54.html and read Open Letters on 9/11 to Attorney General Mukasey. Are these issues raised with Mukasey holding up Holder's confirmation to be our next Attorney General? The great English poet John Milton wrote "hope never comes that comes to all"; though the new administration certainly brings hope to very many, I remain steadfast in my hope, howsoever well deferred it may be, that new people and new thinking at the US Department of Justice will recognize the need for a full, fair and impartial investigation of 9/11 and give it the highest priority. For in a very real sense, the invasions and occupations of Afghanistan and Iraq began at the airport gates of 9/11, yet we have no credible video surveillance evidence of any of the passengers -- let alone hijackers -- at these airports, a very unusual circumstance which has never been explained. Couple this fact with another fact -- that cell and air phone calls were technically not possible, yet such calls were supposedly made -- and we have a second red flag strongly indicating a deception known in the intelligence community as a "false flag black op." Among the very few with the combined motive, means and opportunity to pull off such a black operation involving high tech means including PROMIS and Ptech software overriding and intervening in US Government computer systems is the Jewish state, and you, Mr. Attorney General Mukasey, are a Zionist Jew whose judgment may very well be clouded by conflicts of interest. And you, Mr. Attorney General Holder, have already had your buttons pressed by Zionists and their agents in the cases of fugitive from justice Marc Rich and the rainmaking for his entirely undeserved pardon. I certainly hope you have learned a good lesson and are the wiser for it. If you search my fax broadcasts you will see I give circumstantial evidence potentially linking Jonathan Pollard and Marc Rich as brokers of commodities involving tanker ships in the early 1980s. I have wondered if Mr. Pollard's generous offers to others might have involved PROMIS software. At http://www.show-the-house.com/id54.html you can read all my previous letters to your predecessor; I am ready to assist you in any way I can, up to and including overseeing a real investigation of 9/11. Let me get my hands on the bastards who did this crime even if they're Jews! Visit http://www.show-the-house.com/id1.html and read An Eight Part Peace Proposal for Greater Jerusalem. Let's transform our Zionist buddies from larva stage into big beautiful butterflies! Were I Captain Chesley Sullenberger, who, with all engines lost, glided his US Airways Airbus to a safe, emergency belly landing in the Hudson Fjord, I would deeply resent my having to pee in a cup for the National Transportation Safety Board. What a way to treat a hero! But the Sullenbergers will attend the Inauguration in Washington next Tuesday, and I think this real hero's US Airways jet is an apt symbol of our ship of state as we are finally rid of Bush and stand on a wing and a prayer in the aftermath of his bloody lies, secrecy, destruction and waste. There's much to do on an emergency basis. I hope we all act with the verve and alacrity of the ferrymen who rescued the crew and passengers of Flight 1549. May the Almighty guide and protect us! Just as the black boxes will ultimately reveal details of a miracle on the Hudson, a real investigation of 9/11 will help us better to understand our past so as to illuminate our future. Who was the senior USAF enlisted man who told CNN a helicopter was present when the explosion and fireball occurred at the Pentagon? Who at Fox News said a bomb went off near the Supreme Court Building when no such event took place? You can hear all these reports on 1010WINS radio, which is an integral part of the soundtrack of Richard A. Siegel's video recording of the controlled demolitions of the World Trade Center. See http://www.911raw.com/. This video and the seismic record together give 9/11 best evidence. "We must respond to terrorism by championing the rule of law, not subordinating it, for it is the cornerstone of the democratic society." The UK Foreign Minister's good advice will serve us well. So will Labour MP Gerald Kaufman's repudiation of the cruel and crazy war crimes of his fellow Zionists in Gaza guide us to real peace. As our Zionist buddies smother the lives of so many civilians with cruel implements of war, including illegal white phosphorous (see SANA photo, at right, of an Arab child in Gaza at http://www.show-the-house.com/id54.html), let us bear in mind the chronic suffering of the people of Palestine in terror campaigns and waves of ethnic cleansing leading to the founding of the Jewish state, and the "divide and conquer" policies, including stolen elections, still perpetrated against them. Secretary of State Rice, who vacillated in seeking cease fires in Lebanon in 2006 and now Gaza in 2009, was formerly Provost of Stanford University, home of the Hoover Institute. It was Herbert Hoover who campaigned in 1937 for the "transfer" of Palestinian Arabs from their lands to make room for our Zionist buddies even as a Zionist Congress in Basel, Switzerland, adopted "transfer" as its official policy. So Rice appears to have deep roots in an international enterprise that, by gradual degrees of fraud and force, is dispossessing a valiant people who are now resisting their own genocide. Not an "even-handed broker of peace," Rice has only quickened the siege mentality of the Khazar-descended Ashkenazis who are of Turkic origin and are not the blood of Abraham. So Rice, like Cheney and Bush, knows what's good for the Jewish state. So tell me, Mr. Attorney General, does separation of church and state mean separation of synagogue and state? If so, has our failure to remove an obvious double standard explain why Miss Rice, like Cheney and Bush, was not duly sworn to tell the truth, the whole truth and nothing but the truth when she gave testimony before the 9/11 Commission? After all, inasmuch as the Beebster, Benjamin Netanyahu, said more than once that 9/11 was "good for Israel," wouldn't you think the 9/11 Commission's unequal and exceptional treatment of Cheney, Bush and Rice raises red flags with regard to the integrity of its investigations? Do these red flags lead to Silverstein, Odigo, Ptech, ICTS-International, Comverse, Amdocs, Urban Moving System, the Dovster (Dov Zakheim), Mossad, the Mob, the Syndicate etc.? Visit http://www.show-the-house.com/id1.html and read An Eight Part Peace Proposal for Greater Jerusalem. Let's transform our Zionist buddies from larva stage to big beautiful butterflies! People around the world are troubled by Zionism's full spectrum fraud and force in Gaza, and are at a loss to deal effectively with a chronic problem that has plagued the 20th Century and now threatens this young century. Why does the holy name Israel stink so badly? Consider this tale of three walls: If the Zionists were the real deal (namely the House of Israel and the House of Judah, both prophesied to return to the Holy Land) we would have seen by now a wall of stones with the entire Torah engraved on it, as commanded in Deuteronomy 27:2-3. Instead, we see an altogether different kind of wall, the wall of separation, which is not only illegal according to international law, but belies the very words of Moses on exactly how he and his people would be separated (Exodus 33:16). Lastly, I find that communicating with you is like talking to a wall! You cannot gainsay my presentments! So these three walls tell me the Zionists aren't really who they say they are and that you and your fellow Zionists know 9/11 truth will be the undoing of Zionism. Please read my Ersatz Israel at http://www.show-the-house.com/id55.html. Discover your Khazar roots! Getting back to 1010WINS radio on 9/11, which was recorded live on Richard A. Siegel's video of the controlled demolition of the Twin Towers (http://www.911raw.com/), I ask, how could FOX News give a report of an explosion near the Supreme Court Building in Washington when there was no such explosion? Why such disinformation? According to 28 United States Code paragraph 372 (c), my petition and complaint at the 11th Circuit Judicial Council had the potential to be referred by the chief judges there to the annual Judicial Conference convened by Chief Justice Rehnquist on the morning of 11 September 2001. This potential was neutralized when a US Marshall evacuated Rehnquist and 26 of the most senior judges in the USA out a side door into the street. My petition had all to do with the USS Liberty and the occupied Golan Heights of Syria. Was the falsely reported bomb a signal that this very real risk to Zionist public relations concerns had been obviated by the events of 9/11? Visit http://www.show-the-house.com/id18.html and read A 9/11 Timeline: Did Laughter of the Judges Make the WTC Towers 1, 2 & 7 Fall on 9/11? President Elect Barack Obama's choice of Leon Panetta to be the next Director of the CIA ensures business as usual. Panetta is just another yes-man whose stewardship on the Iraq Study Group serves as a good example. As I alone pointed out in my fax broadcast of 11 December 2006 (http://www.show-the-house.com/id83.html, scroll to that date), the Iraq Study Group reported 5,000 civilian contract personnel in Iraq, whereas the correct figure, we soon found out, is in the order of 100,000. So do you think Panetta, who could not effectively communicate with the Pentagon, CIA and White House for the ISG, is the kind of guy who can level with the President and tell him, for example, that the cell and air phone calls from jets "hijacked" on 9/11 were all bogus? If we cannot have a clean break from the Mena Drug Cartel in the Oval office since the days of the death squads in El Salvador (see cropped Reuters photo, right), and if we cannot talk honestly about the number of civilian contractors in Iraq today, we certainly cannot fathom to what degree they supplement the military's "shock & awe" doctrine to subdue the people of Iraq -- a people, I might add, who never attacked us in the first place! British operatives dressed as Arabs and caught in the act with explosives in Basra on 19 September 2005 no doubt represent the tip of the iceberg according to the Brussels Tribunal. See http://www.brusselstribunal.org/BritishBombers.htm. To what extent do our Zionist buddies influence the war crimes? Ehud Barak, the psychopath still unpunished for mass murder of thousands upon thousands of Lebanese in 1982, is now buying his 2009 election with white phosphorous bombs and the blood of hundreds of children in Gaza. Propaganda, war profiteering and immorality reign. Only a CIA Director who will get real information and level with the POTUS can bring about the change that Obama has promised. But before we move on, we need to go back and confront the truth and consequences of 9/11, and take the other turn in the road not taken before. Afghanistan and Iraq began at the airport gates of 9/11, yet we have no routine video surveillance images. Visit http://www.show-the-house.com/id69.html and read letter to Chief Justice Roberts on question of Barack Obama's qualifications to be President of the USA. 1 January 2009 May 2009 be the year we all hear the whole truth about 9/11!!! To continue my thread on the Associated Press, let me point out that the Zionist/USA doctrine of shock and awe, so well camouflaged by the AP as valiant self defense in Gaza, now prompts Gush Shalom (http://www.gush-shalom.org) to proclaim, "The government has mounted the tiger of war. Now it doesn't know how to get off. All of us will pay the price." But the AP does not neglect the home front, where last week's false reports would have you believe Philadelphia lawyer Philip J. Berg's challenge to President Elect Obama regarding his qualifications to be President was dismissed by the US Supreme Court. While Berg's arguments based on facts and laws pertaining to Obama's citizenship status and qualifications to be President have yet to be put to the test in a court of law, it is perfectly clear that the AP wants to dumb down the citizenry on vitally important issues both here and abroad. The news media's connivance in the Big Lie about 9/11 has never been so well documented than in the CNN audio feed to 1010WINS radio station in New York City, which you can hear at the 11:40 minute mark on Richard A. Siegel's film of the WTC building collapses (http://www.911raw.com/). CNN's Chris Plant, at the Pentagon, related the eyewitness testimony of a USAF senior enlisted man who saw a military helicopter circle the Pentagon and then saw and heard a huge explosion and fireball as the helicopter reached the side of the building next to the helicopter landing zone. 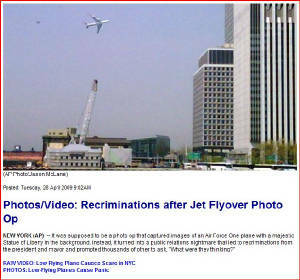 The CNN transmission is promptly cut, and the WINS announcer, Lee, repeats the party line of a jet crash and adds false information that the tail section of the jet was seen by an AP reporter on the scene. Of course a real investigation of 9/11 will also reveal the praxis of evil's editing "on the fly." NYC residents only! Visit http://www.nyc911initiative.org and print out, sign and mail in your petition for a referendum on NYC's November 2009 Mayoral Election ballot which calls for a real investigation of 9/11 and cover-up. Or call 646 537 1755.